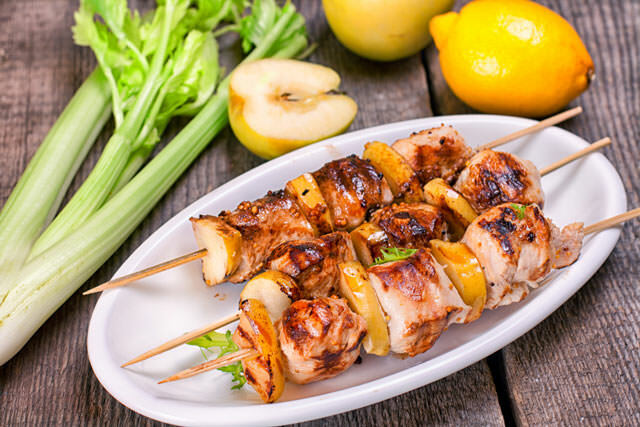 If you are looking to make your barbeques more interesting and healthy, then these kabobs are just what the doctor ordered (perhaps even literally). They are real easy to make, insanely delicious and above everything else, healthy. You can also rest assured the kids will love them. Cut the chicken breast halves into 1-inch cubes and the onions and the peppers into 2-inch pieces. Mix together soy sauce, olive oil, pepper and honey. Set aside small portion of the marinade for brushing while grilling. Put the chicken, peppers and onions in the marinade and leave it for at least 2 hours. Drain the marinade from the veggies and the chicken and thread them alternatively onto skewers. Cook for 15 minutes, turning the kabobs regularly and brushing them with marinade.